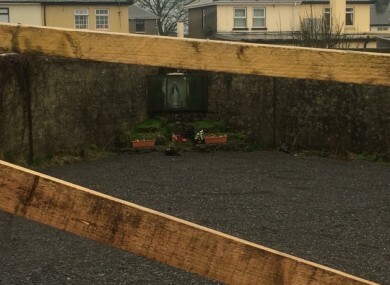 FORMER RESIDENTS FROM the Mother and Baby Home at Tuam have described the experience of being taken away from their mothers following today’s revelation about the mass grave at the site. Earlier today, it was announced that the Commission of Investigation into Mother and Baby Homes discovered a significant number of human remains in what appears to be a decommissioned sewage chamber in Tuam. Speaking on RTÉ’s Liveline with Joe Duffy, former residents who were born in the home, and remained there during the early years of their life, and people who helped to unearth the case spoke of their experience. Historian Catherine Corless, whose work was pivotal in making the case public in 2014, said that the septic tank had stopped being used for its intended use in the late-1930s, and said there could be remains from as many as almost 800 children in the mass grave. She added that Bon Secours need to apologise for a statement made on their behalf by the Communications Clinic in 2014, which rejected the idea that a mass grave would be found there. One former resident, PJ Haverty, was born there in 1951, and spent six years at the Tuam home. He said his mother had to leave when he was a year old, as the people who ran the home did not want a bond to develop between mother and son. He was later fostered out, but found his mother again years later in Brixton, south London. “I was one of the lucky ones – I got into a good foster home and got to meet my mother again after many, many years,” he said. He said he had never seen any indication of what was going on, in terms of mass graves at the home, but said that he and other children had been locked up and had been exposed to so little of the outside world that he didn’t even know what Christmas was. “We had no toys at Christmas there. There was no love, and there was no care,” he said. I don’t call it a home. It was a prison. You look out the window and all you saw was high walls all the way round. Other survivors, Thomas Ward, and a man called Christopher said that were born in the home and the latter did remember seeing the septic tank at the site. Christopher described how his mother was also not let see her son, but would cycle 22 miles to and from Tuam every weekend from Galway city to try to be let in. All callers were unanimous in their praise for Corless in raising awareness of the case which helped lead to today’s announcement. Email “'It wasn't a home, it was a prison': Former residents from Tuam mother and baby home react”. Feedback on “'It wasn't a home, it was a prison': Former residents from Tuam mother and baby home react”.